Deforestation of the rainforests in Indonesia, including Borneo, destroys unique ecosystems. According to studies from 2014 based on satellite photos, an estimate of more than 30% of the original Bornean rainforests have been cleared within just four decades (1970-2010). This corresponds to an area covering 168,493 km2. Larger forested areas, which are or have been subjected to logging, agricultural expansions, or degradation as a result of other causes can be added onto the aforementioned enormous area. But what consequences does deforestation of Borneo's tropical rainforests carry? Deforestation and degradation of forests lead to a decrease in wildlife presence. The animals are robbed of their natural habitat and vital sources of food. Consequently, they are forced out of their natural habitat, and they become easy targets for hunters. The tropical rainforest is among one of the most species-rich ecosystems, and deforestation therefore has severe consequences on the general biodiversity of the globe. Approximately 80% of all the documented species in the world can be found in tropical rainforests. The forest is a natural chamber of carbon, and trees absorb CO2 from the atmosphere via photosynthesis. Meanwhile, deforestation (logging, burning, and decay) is the biggest CO2 emitter after fossil fuel burning. Deforestation causes an estimate of approximately 15% of the world’s collective emission of CO2 and greenhouse gasses. As a result of deforestation, the lack of trees can result in decreased precipitation and a drier local climate. This is due to the trees' abilities to evaporate groundwater. Deforestation accelerates the speed of soil erosion since drainage of water is increased. Additionally, the lack of leaves (nutrients) and shade makes the soil vulnerable and harder to protect. Millions of people around the world are dependent on the forests they live by or in. They live off varying cultivation, hunting, and the forest’s natural resources. Deforestation has social consequences, and in some instances even violent consequences, as families and populations lose their livelihood. 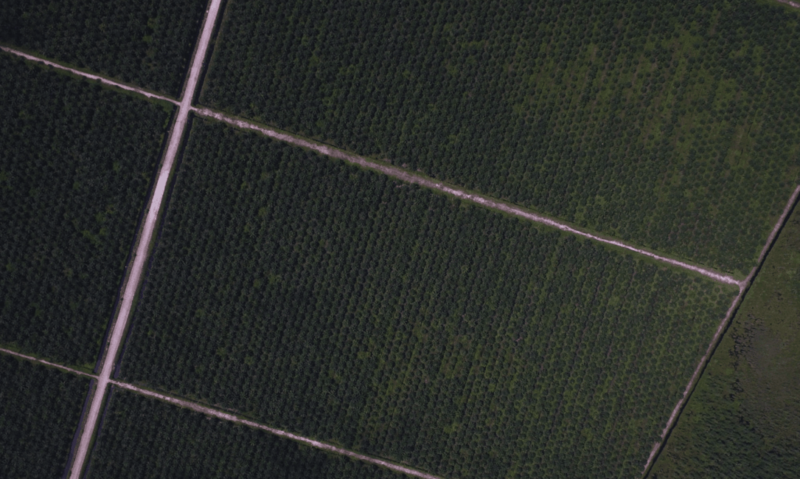 Oil palm plantations (monocultures) on Borneo increase rapidly in numbers, and they are established in areas that originally had rainforests and species-rich ecosystems. The last decades of deforestation on Borneo has primarily benefitted the timber production and the increased cultivation of oil palms. In 2005-2015 alone, 50% of deforestation on Borneo is thought to have benefitted oil palm plantations.